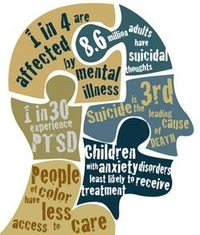 Program Description: This program will allow mental health professionals to gain a better understanding of the nature of suicide so that they will be better equipped to intervene and hopefully prevent suicide within Mental Health, Substance Abuse Treatment and Integrated Medicine Settings. The participants will be provided with new knowledge, skills and abilities needed to identify suicidal ideation and behaviors and gain a better understanding of their role and function in the intervention and prevention of an active suicide. 1. To be able to understand how the Evidence Based Practice of Brief Cognitive Behavioral Therapy (BCBT) interventions can be used in intervening and preventing suicides. 2. To identify the variety of outcomes stemming from use of BCBT in working with clients who display suicidal ideation or behaviors. 3. To identify the typical issues which involve BCBT interventions in suicidal intervention and prevention programming. 4. To identify tools available to get ready to utilize BCBT in clinical settings so as to address suicidal ideation and behaviors.